I just love going to the public library. With the diminishing number of bookstores in the city, there are fewer places one can sit among books, lolling on a rolling step stool, perusing attractive covers and being inspired by an unfamiliar author or artist. 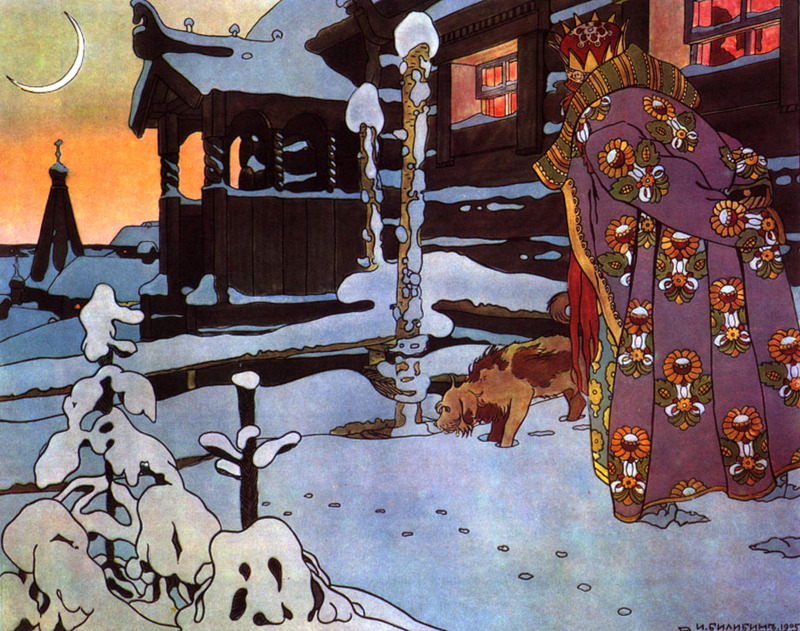 One such artist I happened upon is Ivan Bilibin. He was an early 20th century illustrator and set designer (did work for the Ballet Russes) who was inspired by Slavic folklore. I was struck by the folk nature of the illustrations that called to mind my youth and the hours I spent poring over old books of German fairytales. I would beg my mother to let me color in the black line-drawn illustrations of my books. Once, she did (and I think we still have the book). When I saw these colorful Bilibin illustrations, I felt these were exactly what I had envisioned in my child's mind's eye. Although the outcome of my renderings was quite different! I feel completely transported and satisfied somehow, staring at these amazing illustrations—especially the patterns and elaborately detailed garments of each scene and character. Here are just a few examples.